Samantha is an avid historian and writer and joins us today with a post on Anne Stuart, Queen of Great Britain. You can follow her on her Facebook page Today in Dead Royalty and on Twitter. When I was notified of this post in my Gmail, you couldn’t even begin to imagine how happy and excited I was — considering that I think of myself as a fan (but not over the top that I can’t be objective about her) of Anne but she and her sister Mary (whom I’ve called ‘the forgotten queens of England/Britain’ since they pretty much seem to be like that at least as of now), another one of my favorite historical figures, are so often overlooked by both many historians and history lovers in favor of other supposedly more interesting and scandalous royals. In fact, I’m pretty sure there’s enough juicy gossip and shocking scandals in Anne and Mary’s lives to be the subject of a popular movie, book, or TV series that I’m really disappointed that no one recently has seemingly taken much interest in Anne and Mary, at least in popular culture! 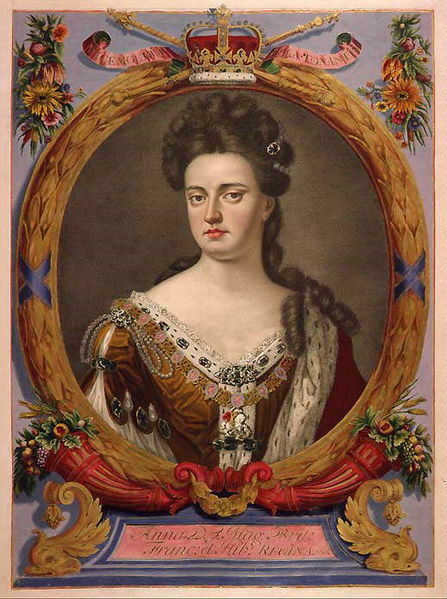 For your list of books for further reading about Anne, I’d like to add my two cents with this recommendation of Anne Somerset’s 2012 biography “Queen Anne: The Politics of Passion”. I believe that it’s well-written enough to keep me hooked for all the time I was reading it but still appears well-researched, more or less objective, and is fairly sympathetic and understanding of Anne, the situations and events she faced in her life, and her choices without necessarily condoning or justifying them. I’ve always thought that Anne was overlooked, and to have 17 pregnancies, and none of your children survive, is something that you can’t even begin to imagine. Poor girl. Thank you, enjoyed the post! Another great post. Takes me back to my visit to Blenheim Palace many years ago. Thanks for sharing. Also, I plan to return to the website Looks like a good one. Thank you Kalli. I must go to Blenheim. Love this time in history. Great post.